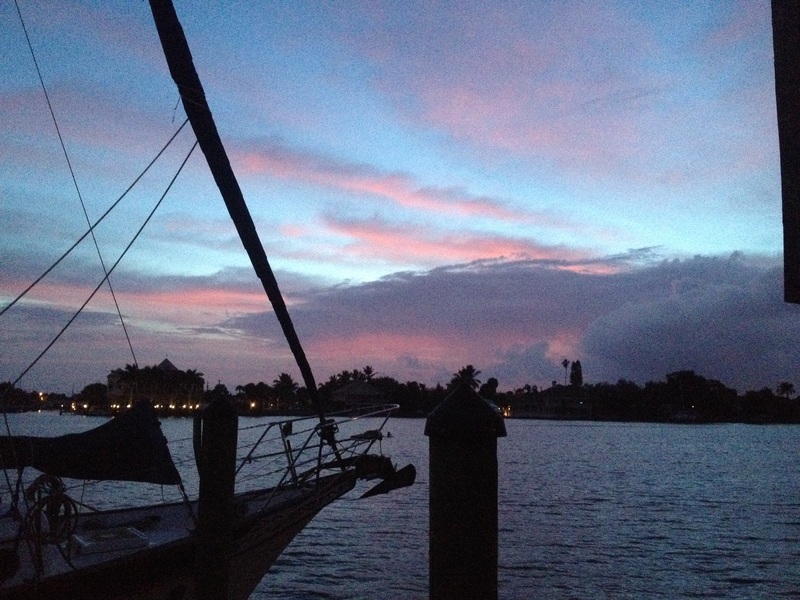 December 2015 – Interested in Learning How to Find, Select and Eventually Live On Board Your Own Sailboat? You're in the Right Place…. Here’s a link to watch our bike assembly video…..a big thank you to Bikewagon.com ….if you’re in the market for a new bike of any kind, try them first…..don’t forget to mention you saw them here on our blog !! Our first successful boat purchase consultation…..!! 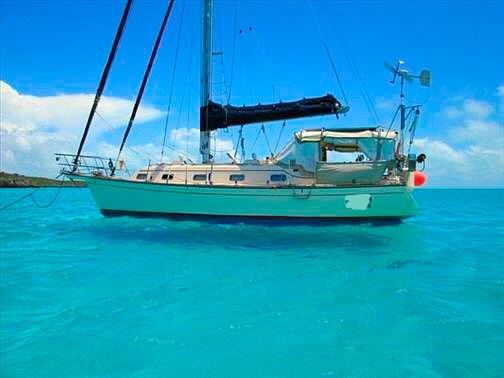 I am pleased to announce that after some time consulting with someone who was considering living aboard and been looking for a liveaboard sailboat that a purchase has occurred !!! In the interest of their privacy, I won’t name this person outright. I can say that they are one of our very best friends and that they have appeared in our blog. And this is their new boat !! I edited the name of the boat out of the photo, since, it wouldn’t do much good to not name them but then leave the name of the boat visible ….😝….I’m sure there is a renaming ceremony in the not too distant future, though. I found this particular boat by coincidence while recently visiting with our friend while we were drinking coffee one morning. I was browsing online for the model of boat they liked. As it turned out, the boat was only about ten miles from their house!! The boat is an Island Packet 350….a great design and this one was apparently owned by someone who was amazingly meticulous and had a great eye for detail. We had only spent about ten minutes on the boat and I could already tell that this was the one for our friend. A full survey confirmed my suspicions that the boat was in fantastic shape and ready to go sailing. She’s scheduled for a bottom job in January and then our friend is planning to make the transition to living aboard over the next few months. Posted on December 26, 2015 December 27, 2015 Categories choosing a boat, Services offeredLeave a comment on Our first successful boat purchase consultation…..!! 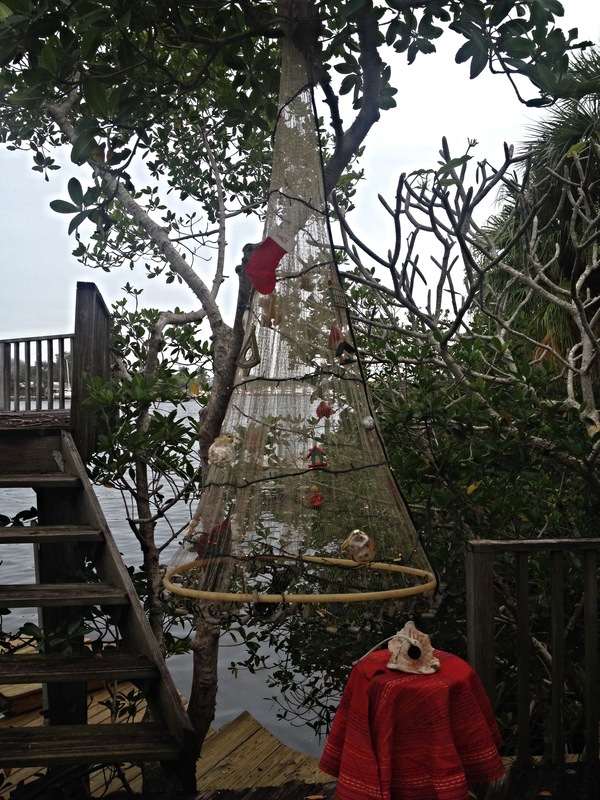 The casting net Christmas Tree ….an ingenious design by our friend Joan…. Well….this month has been a busy one….we’ve had a total of seven visitors on board Kitty Hawk and have two more on the way. We’ve done a lot of work to Kitty Hawk to get her ready for the next leg of our journey. Like any aspect of life on board, using any system can and eventually will, expose any deficiencies or lack of maintenance. During this month, we rebuilt both pump assemblies of our forward and aft heads. For those not up to speed on nautical terminology, a head is a bathroom and also the name of the actual on board toilet. So if you say “I’m going to the head” you just mean you’re going to the restroom. If you say “the head is clogged” you mean that the toilet has failed to deliver whatever was deposited in it to the intended destination, decided to stop the flow of other materials in the future and by extension, ruined the Captain’s day. Now, you may ask yourself, “Why call it a head?”….good question. In the old days when ships could generally only sail downwind, the placement of the head was in the very forward most area of the ship. 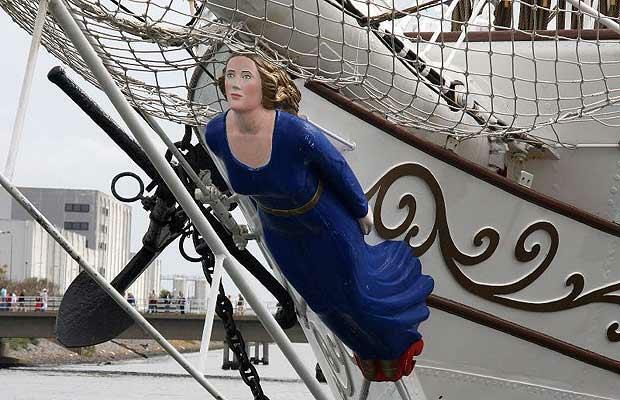 Also, near the figurehead that many ships of that day sported for numerous superstitious, decorative or identification reasons. The natural wave action of the boat moving through the sea provided a “flushing out” as the seawater moved into and out of that space through openings in the hull just above the waterline. Also, since the vessel was sailing downwind the smell was being carried away from the rest of the boat. During our rebuild of our heads, (which are Raritan Compact II manual heads, which means they must be manually pumped to drain and introduce water as opposed to electric heads which just require the push of a button) we ran into an issue where the pump assembly, simply would not stop leaking. We disassembled and reassembled the unit about a half dozen times. It had what we thought was just a difficult seal around one of the bolts that holds the pump to the base. 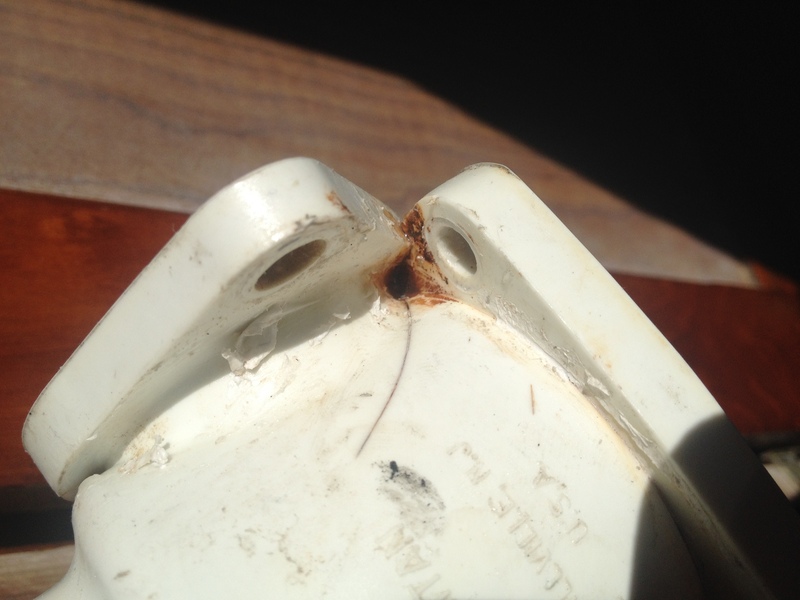 My brilliant wife said “could there be a crack in that we can’t see?” Well, long story short even thought we couldn’t see or feel a crack…there was one…..once we we replaced the pump housing….voilá…no leak. Once the pump was removed we could see the hairline crack on the backside….it looked like a mark from a wrench…..we made sure to inspect all of our spare units and discarded any with a similar mark….so we threw away three of them….which will cost about $110 a piece to replace….ow. Since we had two sets of visitors it was only right that during each visit one of our heads clogged. Our aft head was first during the first set of visitors and then our forward head lines clogged. Maybe two heads really are better than one ? Haha….you don’t want to be without a head at all. I had even made the comment that “if the aft one has clogged the forward one can’t be far behind” how regrettably right I was. We were glad it happened where we were, rather than away from easy access to transportation and parts. Plus, I had assistance from one of our guests when the forward head clogged. The upside is we have rebuilt pumps and brand new lines for both heads now. These clogs are mostly caused by calcium build up from using salt water to flush the heads. We are considering changing to composting heads in the future but for now they are just too expensive plus we should get four or five years of use after this rebuild. 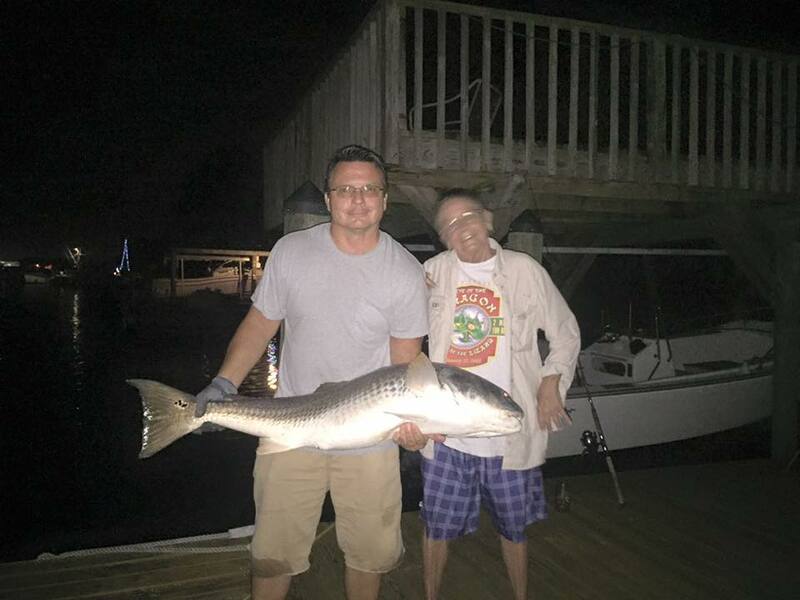 On the upside…between clogged heads…..a neighbor and I landed an enormous Redfish….so two heads did work better than one in that instance……sadly, it was over the size limit to keep but may have been a state record….. I have felt, at certain points in my life, that I had been successful in certain aspects because I had chosen some paths of lesser resistance or perhaps only attempted things at which I already knew, or felt, I could succeed. Right or wrong, I think everyone has these feelings at one time or another. During these times you can doubt your abilities to adapt or overcome adversity, to learn and comprehend new ideas and master new or unfamiliar technologies. The important thing to remember is that no matter how alone you feel, help isn’t far away. This help may come even from within through exercising some patience and the study of your “enemy”. Once you have committed to live on board a boat of any type, you will almost certainly be faced with a situation, repair or replacement of some system or component with which you are unfamiliar or unskilled. This can make you feel very overwhelmed and even helpless. It can even make you want to abandon the dream if you hit a really low spot. A combination of challenges or gear failures can test even the most hearty among us. You will question your decision to pursue the dream you have committed to and wonder if you have done the right thing. After all, for many cruisers, embarking on a long term cruise or to live aboard full time requires a tremendous sacrifice of stability, financial and physical. These feelings can be compounded by the distance from assistance of any type and a lack of readily available support, whether it is technical or emotional. Whenever I am faced with a repair of a system with which I am unfamiliar, I always take the time to conduct a “reasonable” amount of research on the system or component before I try to tackle it. This can relieve a tremendous amount of anxiety. Dealing with the unknown only adds a layer to the stress of the situation. Many systems on a boat, sail or power, have evolved to be reasonably user friendly. The research tactic can also translate to the planning of a trip to a new cruising area. Reading the cruising guides, thoroughly reviewing the charts and comments from others who have visited the area before you can make the unknown much less intimidating. If you are anything like me, knowledge reduces stress. Don’t be afraid to contact a professional and get their input. I was initially surprised how many will give you free advice (not unlimited) on how to best tackle your problem. I have even enlisted professionals to evaluate my repairs for as little as one hour of their normal labor rate to be certain I hadn’t missed anything. You’d be surprised how generous they can be with their time in these circumstances. I can’t imagine how some cruisers make it. I have seen many online requests for help because the people living on their boat didn’t know how to fix or maintain their engine, outboard, dinghy or any other systems and were apparently unwilling or unable to research the repairs and couldn’t afford professional help. Their first and only recourse was an online plea through social media for assistance. Most of these requests are from the same people over and over again. Living with that degree of uncertainty would most certainly diminish my enjoyment to the point that I might surrender and I’ve seen almost all of those cases end up in a “Boat for sale” posting. Research. You know how they used to say “Reading Is Fundamental” ? Well, it wasn’t just a catchy slogan. If you know going in that you can’t afford much (or any) professional help, learn as much as you can about your potential dream boat’s systems. Take “baby steps”. There are tons of seminars (online and real time) being given away out there. They cover everything from repairs and maintenance to upgrading and even boat handling skills. Go to (and watch online) as many as you can. Be prepared to get a “starter boat” and move up from there adding complexity as you go. If you can’t resist buying your dream boat right out of the gate, limit your cruising until you can become versed in the systems and their upkeep/maintenance. That way you don’t end up stranded in a remote location. Be realistic. Don’t make your first boat a Pandora’s box of systems you know nothing about and assume nothing will break or go wrong. The learning curve can be steep and you don’t want to break the bank (or your spirit) in the process. Finally, remember it’s supposed to be a fun adventure, not a soul crushing grind. If you don’t rush things and learn as you go, even a complex problem can be an enjoyable challenge. And now, a moment to relax after discussing all those stressful obstacles…..